Specifications of the most awaited of smartphone from the house of Canadian manufacturer are revealed. The smartphone code named as BlackBerry Aristo model no: A10 is the successor of BlackBerry Z10. This 4G / LTE smartphone supports both GSM & CDMA network. BlackBerry A10 Aristo sports a 5 Inch OLED Capacitive Touch Screen with multi touch. On the display resolution front this smartphone features 720 x 1280 Pixels, ~294 ppi pixels density, 16 M Colours. Dimensionally BlackBerry A10 Aristo will measure 140.7 x 72 x 9.4 mm (5.54 x 2.83 x 0.37 in), it will be available in just one colour viz; Black, the weight in not yet known. Beneath the skin this smartphone holds a Dual Core 1.7 GHz Krait Processor, Qualcomm MSM8960 Pro Snapdragon Chipset, Quadcore GPU, 2 GB RAM. BlackBerry A10 Aristo technically packs some good specifications which will make it a desireable smartphone for multi taskers & especially gamer. 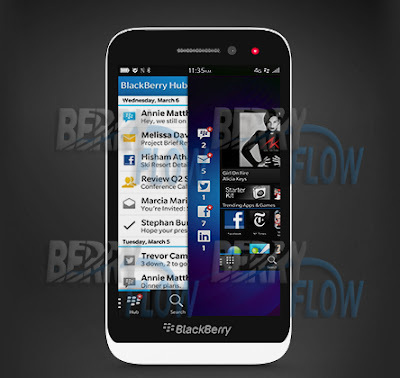 This smartphone comes out of the box with BlackBerry 10.2 OS. BlackBerry A10 Aristo stocks an internal memory of 16 GB with an SD card slot which supports upto 64 GB microSD card. The data connectivity aspect of this smartphone is loaded with Wifi, DLNA, Bluetooth v4.0 with A2DP & LE, NFC, microUSB v2.0, GPS with support for A GPS. The primary snapper on the rear of BlackBerry A10 Aristo is of 8 MP with LED Flash light, auto focus, geo tagging, face detection, image stabilization, video stabilization. The shooter of this smartphone is capable of clicking images of 3264 x 2448 Pixels & record videos of 1080 P @ 30 fps. The secondary camera is of 2 MP which can record videos of 720 P @ 30 fps. It will give a brilliant video chatting experience. BlackBerry A10 Aristo has a Li-ion battery of 2000 mAh.